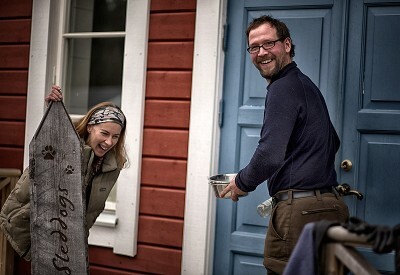 The company is run by the couple Anette Jönsson and Andreas Holland. Andreas was born in Germany and moved to Sweden in 2004 to live his dream. Andreas is the Site Manager and head guide, he is in charge of all the practical details of the company. Andreas is an excellent chef and also an educated master baker in Germany, he prepares fantastic good food and bakes wonderful bread. Andreas has over 20 years of experience with Sleddogs, he has a hunting license and several complementary educations such as hunt leader, bear tracking, wild investigator, snaring and trapping. Andreas also has an international wilderness first aid education through WMI NOLS. Nature, hunting, fishing, cooking and dogs is Andrea’s passion in life. Anette has her roots in Tornedalen but has lived in many different places before she found her way home, when she permanently moved here in 2005. Anette is the CEO of the company, she has a project management training and a M.Sc. degree, responsibility for the economy and market and is also working as guide. Anette has since childhood loved animals, outdoor life and adventures, some of her previous hobbies has been climbing, scuba diving, motor biking, downhill and cross country skiing, obedience dog training. Anette also has a first aid education. Animal, nature, outdoor life and adventure is Anette’s passion in life. All our activities and tours are well-planned and -organized to ensure best possible quality and safety. Everyone takes part in our activities at their own risk and therefore we request all to underwrite a good travel- and accident insurance. All, animal as well as people is treated with kindness and respect. The company is environmentally conscious and working for a long-term sustainability.